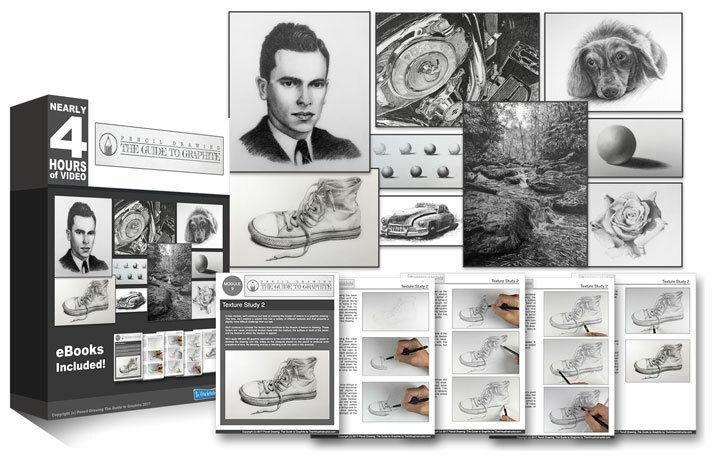 Description: How to create the illusion of texture in a graphite drawing and the factors that most contribute to success. The second of three subjects is explored in this module. I think it’s too hard even impossible to make it 🙁 how after following your courses like drawing a ball shade etc .. can I all of sudden be able to draw this shoe it’s very frustrating it’s like in your courses you have 2 levels beginners or already drawers. it’s the same for the blank rose or gorilla it would be better to have more courses for the beginners. It’s sounds like you’re frustrated. We can’t just draw simple objects and expect to improve. Sometimes, we have to challenge ourselves to grow. This means that we must take on subjects that are a little more difficult than a sphere. This shoe, while it has some complexities, is still rather simple. The same can be said for the gorilla from The Secrets to Drawing course. Have you tried drawing the shoe yet? You have to be willing to put in some effort to improve. While gaining the knowledge is essential, nothing will happen unless you push yourself – at least a little. You’ve probably improved by now and don’t need advice, but I grid the difficult organic subjects and then work grid by grid. I’m always amazed at how well they turn out and slowly my freehand sketching is improving. I empathize with Kevin’s frustration. I have been a “beginner” at drawing for years. There are multiple reasons why I never got through the beginner wall but one of them is that frustration Kevin talks about. I latched on to something while taking Matt’s beginner course and that is to give my self permission to make bad drawings. My sneaker drawing is sad compared to Matt’s but I learned from it, set it aside and did another one. I have the kind of personality that does not like to do a thing badly…but I have to allow myself to start badly and practice practice practice in order to get better. ….Just a note to share the pain and encourage Kevin to break through that wall. I appreciate Kevin’s frustration but you have to push yourself in order to improve as well as practice, practice and practice again.